Bounce Houses are one of the great American traditions for event entertainment. These colorful inflatables are loved by all ages and have the ability to entertain for hours with a spirited, healthy activity. U Bounce Inc. has a great selection of large bouncer rentals for our Kentucky customers, which are the centerpiece of joy, laughter and fun! You can be assured your bounce house rental will arrive on time, cleaned & sanitized ready to work at your event. Browse the selections below and click the image or the "More Info" link for more information, including it's description , additional photos and to make a reservation. If your looking for something bigger and with a slide, visit the Combo Bouncer Rentals page. What is a Combo Bouncer? A Combo Bouncer is an bounce house with more fun factors like a slide, basketball hoop, obstacles and different activities. Why not add a special treat for the occasion? Cotton Candy and Sno-Kones are the fun foods they will remember! "We'll Get Your Party Jumpin'!" 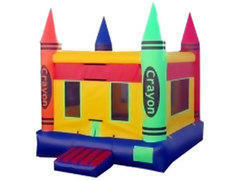 A great selection of large 15ft x 15ft x 15ft commerical grade bounce house rentals for all ages. Yes, even adults! 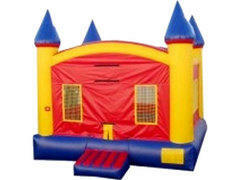 Clean, sanitized and well maintained inflatable bounce houses delivered to your party or event. All our inflatables and equipment are cleaned and sanitized after every rental to ensure a safe environment for all our customers. Not only are they cleaned once, but you will see the U Bounce Inc. team cleaning each bounce house again before you use it. U Bounce Inc. Inflatables & Party Rentals delivers bounce house rentals to your event in Harrodsburg, Danville, Lawrenceburg, Lexington, Frankfort, Nicholasville, Lancaster, Stanford, Versailles, Richmond and throughout the Central Kentucky area. Don't see your area here? Give us a call!